Today’s little tip/lesson is one that I have learned the hard way a few times. It is also a tip that is for general quilling, not just for jewelry, but I’m adding it here to make sure those who are looking for quilled jewelry tips come across it! So the lesson is…. sometimes you need to start over! It is better to lose some time and some supplies rather than have a bad final product. Obviously if the mistake is minor and the piece is only for yourself, you might want to just go ahead and use it. But if you are giving it away as a gift or selling it, you definitely want it to look its best! Here is a recent boo-boo that I made when I was creating my peacock themed earrings. As I was putting in the beehive I had a little too much at the end and I couldn’t get it to tuck in properly, so as you can see it got kind of smushed. If it was just for me I could have used this as the back of the earring, but I wanted it to look as good as possible. Instead of letting it dry and trying to fix it (hardly ever works!) I immediately pulled the strip of paper out as the glue was not 100% dry yet. Whew! If you are able to take the mistake piece out before it is dry you can almost certainly save the piece. Then all I had to do was use a new piece of paper, create my beehive coil again (beehive tutorial coming soon!) and redo this section. The second time it worked just fine. Here is another time when I was making a custom pair of earrings in a certain pattern. For my first try I wasn’t sure how long my strips of paper needed to be. When I was finished it was obvious that the earrings were not up to standard and looked weak and not smooth. So I had to start over again, with longer strips this time! What happened to the first set? It’s still sitting around in my mistake drawer. It’s one of those times when it can’t be salvaged, just has to be thrown away. But a happy customer is more important than a bit of wasted time and paper for sure! So if you are working on a piece and it’s not something you’d be proud to call your own, it’s time to cut your losses and start over! It happens to all of us 😉 Do you have a similar story to share? Feel free to comment and share! Stick around, there is plenty to see on the blog! Definitely agree I’d re-do too. However, I find these boo-boos to all be required learning lessons or else I’d never improve. Actually, I glue them down to card stock and write the measurements of the improved, final version next to it and keep it for future reference – because the nicely finished item is too good to use for that, LOL! Good idea about using the boo boo to keep as reference! I make little drawings of all my patterns and write down the measurements. I’d be lost if I lost that notebook! 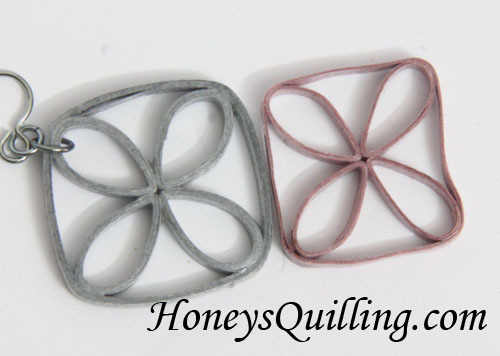 Check out all of the free tutorials here: http://www.honeysquilling.com/free-paper-quilling-tutorials/ enjoy!